In Cape Town we only think of damp problems occurring in winter but they can occur in summer too! IT’S a funny old time of the year, this. After all the rain of early summer we are now in a dry spell. We’ve had the odd shower but nothing really to test our homes. Indeed, I have two clients’ properties where works have been carried out to overcome the leaks of May and June and I now want to see if the work has done the job. I could use a hosepipe but that doesn’t really simulate normal conditions, so I have to wait for rain. Our dampness problems are not necessarily connected to leaks from rainfall. Rising damp can be evident all year round and so can condensation. In fact, signs of rising damp and condensation can be caused by the same problem – high levels of humidity in the atmosphere. Rising damp is the result of dampness in the ground, soaking into the wall then gradually being attracted up the wall by the porous qualities of the bricks or stone. The wetter the ground, the worse the damp. In that case why is it showing damp now when we’ve had little rain? The dampness from the ground isn’t pure water – it contains natural chemicals from the soil. As the damp rises up the wall it will only go so far up before it migrates to the plaster or brick faces where it evaporates. When the water evaporates, it leaves the chemicals behind, building up at the surface areas. 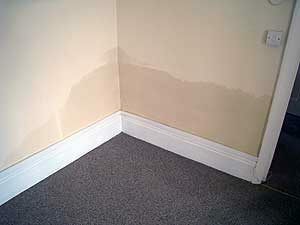 Some of these chemicals can give the manifestation of damp when the wall itself is dry. That’s because the chemicals absorb moisture from the atmosphere. When there is a high humidity level in the atmosphere any previously damp sections of wall can look as though there is new rising damp because the chemicals show up as damp patches. Surveyors must be wary of this when they stick their moisture meter on to the wall and smugly advise the owner that they have a dampness problem. High humidity levels are a problem in summer. The warm air absorbs moisture as it crosses the Atlantic and carries it along over the land. As it cools, it will either rain or leave us with ‘muggy’ conditions. This muggy moisture can be absorbed by the chemicals. It isn’t just rising damp which has a chemical residue. Old sooty chimneys can be a problem. A chimney that was used for a coal fire over a long period of time will have left sooty deposits inside the flue. When the stack is in use it isn’t a problem but once we stop using the stack it can become a nightmare. Over time the salts will again migrate towards the surface of the chimney. It happens principally at the top of the stack so for those chimneys that go up through the roof space you wouldn’t see the problem unless you climbed into the loft. But where you have a stack at the edge of the roof, the plasterwork on the chimney breast that is just under the line of the ceiling, can show damp. Again this damp primarily occurs in summer, when there is high humidity. Condensation results from high levels of humidity in the atmosphere. It also requires a cold surface and still air for it to become a problem. If you eradicate one or more of these causes then you get rid of the condensation. The problem at this time of year is we can have the high levels of humidity and where there are cupboards or wardrobes, which don’t often have open doors, then the condensation can start to develop. You come back from your holiday or long weekend away and the foisty smell hits you as you open the cupboard door to put your holiday bits away. If you don’t empty the cupboard, air the clothes and leave the doors open, then you find the tell-tale blue or black mould starting to develop on handbags or shoes. So don’t think that dampness only strikes in the wet winter weather. Late summer can be just as big a problem.